JAISAL NOOR, TRNN: This is Jaisal Noor for the Real News Network in Baltimore. A well-regulated militia, being necessary to the security of a free state, the right of the people to keep and bear arms shall not be infringed. Well, that’s the Second Amendment, which is at the center of the current raging Constitutional debate over the ability of the federal government to restrict or regulate gun ownership in America. Joining us from Houston, Texas to discuss this is Gerald Horne. Gerald holds the John [H] and Rebecca Moores Chair of History and African-American Studies at the University of Houston. Thanks so much for joining us. GERALD HORNE: Thank you for inviting me. 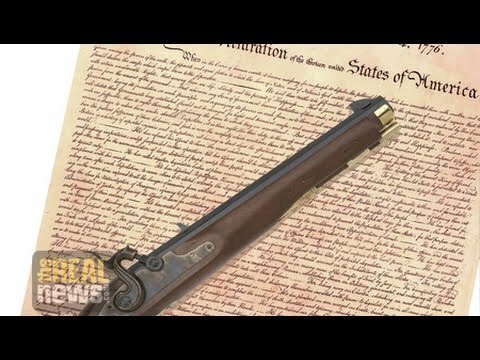 NOOR: So I wanted to, to start with the history of the Second Amendment, because many aren’t aware of exactly how it was applied during the founding of this country. HORNE: Well, first of all you have to recognize that like most provisos of the U.S. Constitution, formulated in the late 18th century, there was both a class and race bias to these provisions, which is one of the reasons why it’s so difficult for people of color today to receive Constitutional protection. What I mean is, is that the Second Amendment certainly did not apply to enslaved Africans. All measures were taken to keep arms out of their hands. The Second Amendment did not apply to indigenous people, because the European settlers were at war with the indigenous people to take their land. And providing arms to them was considered to be somewhat akin to a capital offense. So the Second Amendment was mostly applicable to the settler class. Keep in mind that even after the U.S. Civil War, when the enslaved Africans are freed, a good deal of the battles of the bloody reconstruction period, circa 1865 going forward, was about keeping arms out of the hands of black people. And indeed, one of the central reasons why the terroristic Ku Klux Klan was organized in the post-Civil War era was precisely to disarm black people. So in order to understand the Second Amendment, you have to understand that its interpretation has been heavily dependent upon the current political scenario as it might have existed at a particular moment in time. NOOR: And from my understanding, there is a historical debate over what militias meant in the Second Amendment itself. Were they about defense against tyranny, or they, were they about slave patrols and suppressing enslaved people in this country? HORNE: Well, there is another issue, too, that needs to be raised. Since the Second Amendment speaks precisely to a well-regulated militia, the question is does that right devolve onto a militia, or does it devolve onto individuals, which is the way it’s interpreted today? Militias were needed precisely to repress rambunctious and rampaging enslaved Africans, and marauding indigenous people. And that is what the Second Amendment was all about. NOOR: And so, you know, there was a major Supreme Court decision just less than ten years ago, I’m actually pulling that up right now, which exactly–did exactly what you said. It affirmed the right of individuals to own guns. And so, talk about how this whole debate is transformed–you mentioned that the Civil War, you had returning, many former enslaved people returning to the South whose guns were taken away. They needed to defend themselves. There was a huge debate around that. And then even jump 100 years later when you had the Black Panthers arming themselves, going into the California state capital to defend their right to gun ownership. Because they were, you know, black people were being killed by law enforcement en masse at that time. HORNE: You are correct. Once again, it’s folly to try to interpret the Second Amendment absent the historical context. That is to say, as you correctly note, when the Black Panther Party went into the California state legislative chambers in 1967, it caused outrage and consternation in certain circles, and even the National Rifle Association, which is now a purist with regard to the Second Amendment, not tolerating any restrictions on gun ownership, at that particular moment it was coming out in favor of gun control because it was terrified by the possibility of black people arming. Likewise, today you cannot understand this mania about guns without understanding the fact that there is a right-wing movement that is rising that even certain mainstream Republicans say carry a whiff of fascism about them. You have the Southern Poverty Law Center discussing the unavoidable fact that since the election of Barack Obama, the first black president, the number of armed militias has increased. And of course, they’re now parading around eastern Oregon as we speak. And it’s very striking that the town hall debate on guns held at George Mason University a few days ago, and broadcast on CNN, [Mark] Tilley is the spouse of Gabby Giffords, the congressperson who was shot in the head in Tucson about five or six years ago, raised the question that there are about 350 million guns in the United States right now, and 65 million [sites]. And he wondered how the right wing could come to this conclusion that Washington could collect all of these guns, 350 million, and 65 million sites. Obviously that is not possible. But the reason they raised that point is to create hysteria. And the reason they’re trying to create hysteria–and I have to word this carefully–is because the right wing in the United States has not ruled out the possibility of a mass armed uprising against a particular government they do not like. That’s the import of what’s going on in eastern Oregon, as we speak. NOOR: And I wanted to touch upon that, because you see how the media portrays this. The armed–the armed insurrectionists taking over federal land, versus how it portrays the Black Lives Matter movement. You know, you talked about how this whole debate about how, you know, being propelled by the, the gun lobby, and how President Obama’s presidency plays into it. You know, gun–gun manufacturing has doubled in this country since President Obama took office. And you know, how has the media kind of played into this? Because at the same time, the media has reported this massive crime wave all over this country over the past year, which actually didn’t happen. The statistics have shown that crime is actually down over the last 25 years, including violent crime and homicides, except for a few cities like Baltimore, which this year had the highest amount of per capita murders. So this is all happening while, you know, the Black Lives Matter movement is demanding police, you know, rein in some of their tactics, stop killing unarmed black men, respect black lives. How does that factor in? HORNE: Well, first of all, with regard to the media, a the town hall at George Mason University you may have noted, noticed, that Anderson Cooper of CNN was giving credence to this idea that there was going to be a mass roundup of these 350 million weapons that I’ve just made reference to, spearheaded by President Obama himself. That was an abdication of journalistic responsibility, not to mention ethics, on his part. With regard to eastern Oregon, it’s very curious that the law says that waving a weapon at federal officials is a crime subject to indictment, but we’re still waiting for an indictment to be rendered against these thugs and terrorists in eastern Oregon. Speaking of thugs and terrorists, and the invocation of those terms, it’s quite striking that when you had civil unrest in Baltimore, the media was quick to denote the protesters as being, quote, thugs, unquote. And yet that particular appellation has not been used against those who are now rampaging in eastern Oregon. Of course, we should not be surprised by that. Those who have the smallest familiarity with U.S. history knows that there is a racial bias that runs through the course of U.S. history. And with regard to this question of a supposed spike in crime, well, obviously statistics do not bear that out. Raising that question is a way to put gust in the winds of the gun maniacs, to give them the idea that the way they can protect themselves against supposed criminals is to keep a gun under their pillow. Certainly this is folly of the [rankest] sort. NOOR: And finally, how do you evaluate how President Obama has approached this issue? You know, he pushed–he put forward reforms back in 2012 after Sandy Hook, which were of course blocked by Congress. So now he’s laid out several executive actions, which would only deal with current enforcement through increased background checks, you know, demanding all gun sellers register weapons. And he’s asking for more money for things like mental health research and gun research. Obviously his hands are tied, but do you think these are steps in the right direction? HORNE: Well, they’re steps in the right direction. But I think the problem is the ultra-right wing, which at its fringes has not relinquished the idea of having a mass armed uprising. For example, the right wing in Congress talks about enforcing the books, the laws on the books. But if you look at the budget of ATF, Alcohol, Tobacco and Firearms, part of the FBI which is designed to regulate firearms, the Republicans cut their budget repeatedly. With regard to the Centers for Disease Control, another federal agency, the Republicans have made sure that the CDC cannot investigate the public health consequences of having so many guns sloshing around the United States of America. There is a serious problem in Washington, a serious abdication of responsibility, and I dare say that people who are watching Real News, particularly people of color, are at risk to becoming victims of this gun mania that the ultra-right wing is helping to fan the flames about. NOOR: Well, Gerald Horne, thank you so much for joining us. HORNE: Thank you for inviting me. NOOR: And we’ll certainly continue this conversation at TheRealNews.com. Thank you so much for joining us.